Flight 202 originated at Buenos Aires, destination New York, with en route stops scheduled at Montevideo, Uruguay; Rio de Janeiro, Brazil, and Port of Spain, Trinidad. The flight departed Buenos Aires 18:52 UTC. After a scheduled stop at Montevideo the flight arrived at Rio de Janeiro at 01:05, April 29. The flight departed Rio de Janeiro at 02:43 for a direct off-airways flight to Port of Spain. At 06:16 the flight reported abeam of Barreiras, flying at 14,500 feet under VFR conditions and estimating abeam of Carolina, Brazil, at 07:45 UTC. This was the last known message from the flight. The aircraft was later found to have crashed in dense jungle. 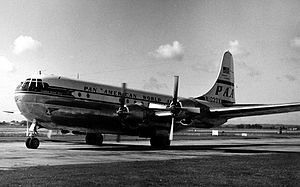 Pan American World Airways Flight 202, registration N1039V, was a Boeing 377 Stratocruiser aircraft which crashed in the Amazon Basin approximately 220 nautical miles (410 km) southwest of Carolina, Brazil on April 28, 1952. All 50 on board were killed in the accident. Flight 202 had begun its route the previous evening in Buenos Aires, Argentina, with stopovers in Montevideo, Uruguay, and Rio de Janeiro, Brazil. It departed Rio de Janeiro at 3:06 am local time for Port of Spain, Trinidad and Tobago, with an eventual destination of New York City, New York. It was cleared to fly an off-airways route directly to Port of Spain; this took it over the (at the time) unexplored forests of the Amazon jungle. The pilots reported abeam the town of Barreiras, Brazil at 6:16 am local time, and estimated the next position report (abeam Carolina, Brazil) at 7:45 am.